The government of Haiti has dispatched mobile health teams to remote areas of the country to meet the needs of women who want to space their pregnancies but have limited access to family planning services. Photo by Jhpiego/Karen Kasmauski. Ouanaminthe, Haiti—When Ruth Bristol arrived at the Ouanaminthe Health Center, she headed straight for the mobile team to discuss and easily access a long-acting or permanent method of family planning, which only the mobile team could offer to her and other Haitians. Ruth had heard about this mobile team when a sound truck circulated through her neighborhood, announcing the team’s upcoming services. Until that day, the 36-year-old Ruth had been using a contraceptive pill. But the mother of six children was interested in a permanent method that had been unavailable to her previously. “When I heard the sound truck announce that a mobile clinic was taking place at Ouanaminthe and that services were free thanks to the American government, I told myself: finally, I have an answer to my prayers,” said Bristol. Ouanaminthe Health Center is one of 82 family planning sites supported by the United States Agency for International Development’s flagship Maternal and Child Survival Program (MCSP), which is led by Jhpiego. The health facility is now one of three regional centers serviced by departmental mobile teams already established by the project, as a joint effort with MCSP and the Ministry of Health’s Family Health Bureau (DSF). The mobile team’s arrival followed discussions and planning with the DSF to establish protocols for the initiative, identify mobile team members and meet with women’s groups to educate community members on the health benefits of birth spacing and long-acting methods. This mobile team serves northeast Haiti. Each team consists of the site’s medical director, a gynecologist, an anesthesiologist, a nurse and a reproductive health officer. Arriving near dawn at the health center, Ruth joined a counseling session with a group of women who also had heard about the mobile clinic via a sound truck. She was specifically interested in the option for tubal ligation—something she had always wanted but could not afford. “I had previously opted for pills, but the risk is that I may sometimes forget to take them. I wanted to do tubal ligation before but could not due to financial constraints,” she said. Ruth Bristol reviews consent form with family planning counselor. Photo by Jhpiego/Gerbine Felix. Like many women at the mobile clinic, Ruth has a partner but is unmarried and lives in a rural community. Typically, women in these types of partnerships are aware that their partners can leave them for another woman, so they often do not want to risk being left alone with more children than they can support. According to the last Maternal Morbidity and Mortality Report (2012) for Haiti, 53 percent of women who are currently unmarried but who live with their partners do not want any more children, and 28 percent want to delay their next pregnancy by 2 years. In this same report, the fertility rate varied between 2.6 and 4.4 children per woman in urban and rural areas, respectively; the rural rate surpasses the national average of 3.5. 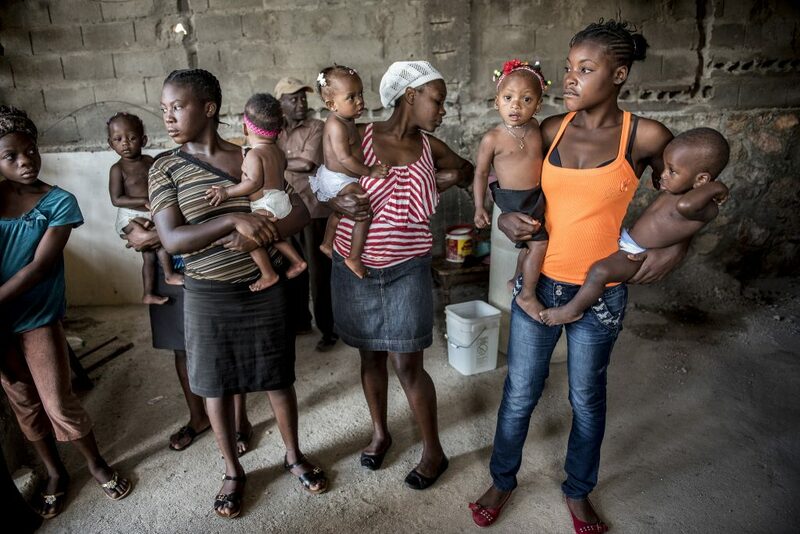 In Haiti, 35 percent of women of reproductive health age are not using contraception but say they want to prevent or delay pregnancy, reflecting an unmet family planning need. Knowing the need of populations in remote areas, MCSP, in partnership with the Haiti Ministry of Health, prioritized the revitalization of mobile teams to make available an array of family planning methods: short- and long-acting and permanent surgical methods. The turnout at the Ouanaminthe Health Center was almost two times more than the number of women the clinic could actually serve due to available supplies, thus demonstrating the popularity of and demand for a mobile family planning team. Since the deployment of this mobile team, three additional teams have been mobilized to other areas of Haiti and served 194 women with long-term and permanent family planning methods. Two more teams are planned to be trained in the near future. Thanks to these efforts, remote communities can be assured that this much-needed service will soon become available to even more Haitian women and their families.